Which came first, the confidence or the stock market rally? One thing is for sure, the crash in stocks in December has crushed the hope of Americans that their economic future is going to be better under President Trump. Overall confidence dipped to 58.1 – a 4-month low, but, U.S. consumers this month were the most downbeat on the economy since November 2016, a third straight drop after expectations reached a 16-year high just three months earlier, as the partial government shutdown wears on toward a fourth week. Measures for sentiment among high school graduates and those 65 and older both fell to the lowest since July. The measure also fell across most income levels as well as for Democrats and independents; but confidence increased among Republicans, renters, and for workers earning more than $50,000. Bloomberg notes that the faltering sentiment reflects a dimmer economic outlook among Americans amid the longest U.S. government shutdown on record. 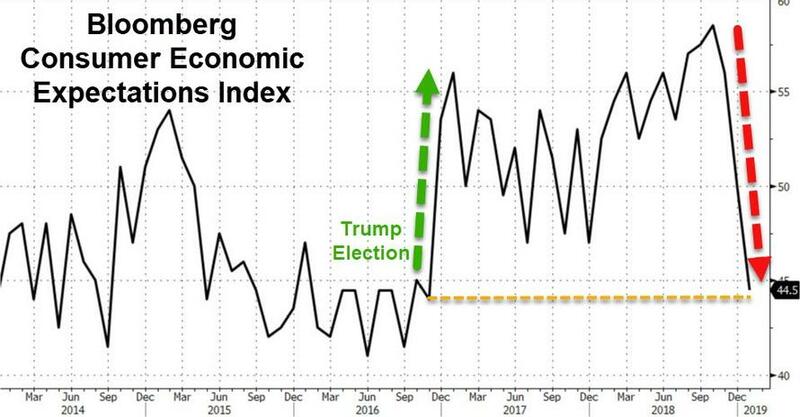 The monthly gauge also fell sharply during the last lengthy shutdown in October 2013, when the index dropped the most since the last recession; it rebounded the following month with the government open again.